One of the many challenges facing urban maintenance organizations is the time and resources dedicated to clearing out spaces under bridges where people occupy illegally. Despite performing routine clean-up efforts that involve clearing biohazardous trash and sanitizing bridge bays, and installing expensive security measures like custom fencing and rock lining bay floors, the spaces are often reoccupied immediately. This complex issue creates safety hazards for work crews and certain quality-of-life concerns for the community and the motorists, cyclists, and pedestrians that use these roadways. PennDOT crews prepare to santize the bridge bay for the I-676 bridge at Fourth and Callowhill streets in Philadelphia. In an effort to secure the areas in a more permanent manner, District 6 developed an innovative, low-cost security measure that can be fabricated in one day using recycled guide rail. 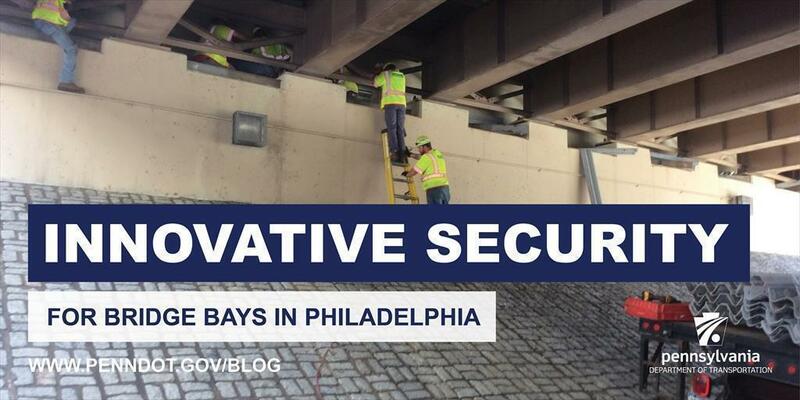 In September 2015, guide rail components were installed to block all 30 bays underneath Interstate 676 at Fourth Street in a popular residential area in Philadelphia. Two years later, the method has been proven to be effective and efficient with only one bay needing adjustment due to improper panel placement. Since its installation, District 6 has received high praise from residents and state and city officials. Look for similar measures to be installed underneath other bridges in the region where this type of security is needed. PennDOT would like to thank city officials, the Philadelphia Police, Fire, Water and Streets departments, and Social Services for their efforts and implementation of this new and successful security measure. Philadelphia City Fire Department Engine 20 helps perform a high-volume water fulsh on the I-676 bridge at Fourth and Callowhill streets in Philadelphia.